Pakistan is observing Kashmir Day today (February 5) to show solidarity with the Kashmiris in their struggle for freedom. A one-minute silence was observed nationwide at 10 AM in tribute to the Kashmiri people on Kashmir Solidarity Day. Conferences, rallies, and protests are also scheduled for the special day. 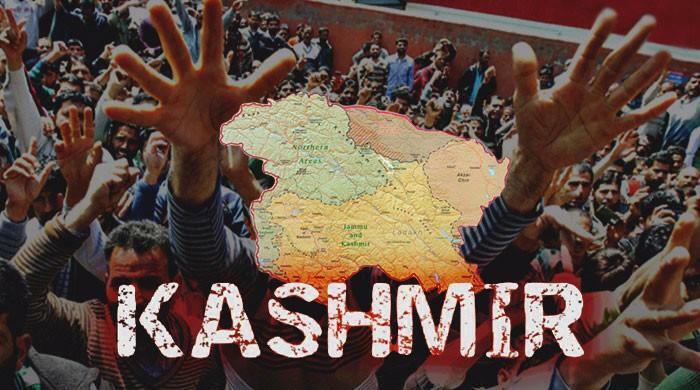 People will also be forming chains by holding hands at locations that connect Kashmir and Pakistan, such as Azadpatan and Kohala and Mangla bridges. In its press release issued on Saturday, Inter Services Public Relations (ISPR) released ‘Sangbaaz’ – a song underscoring the Kashmir Day and struggles of the people – and said that “atrocities in Held Kashmir [Indian-occupied Kashmir] must stop. Kashmiris must be given their right of self determination,” in accordance with the United Nations Security Council resolutions. Revealing the song a day before February 5, ISPR paid tribute to the public’s collective hope. Moreover, DG ISPR Major General Asif Ghafoor tweeted that the Pakistan Army reiterates its full support to the people of the occupied valley. On February 5, the nation pays homage to Kashmiris who have lost their lives in their struggle for freedom against the Indian forces.